Destination Imagination is designed to teach the creative process by getting kids to work together effectively to tackle difficult problems by imagining, creating, and evaluating their own solutions to our Challenges. Parents, Team Managers, family members, and friends are not allowed to interfere by suggesting ideas, or trying to push the team in a particular direction in an attempt to help them solve their Challenge. We call this Interference, and it’s not allowed! 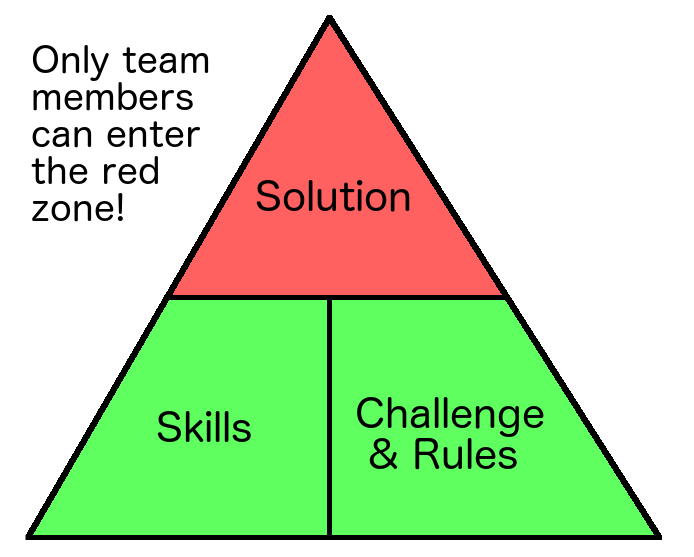 As a Team Manager, you are allowed to help your team understand the Challenge that they have chosen, but you are not allowed to help them solve it. Outsiders (including Team Managers) can only facilitate the acquisition of skills and knowledge. For example, if a team needs to learn carpentry, a parent might contact a local contractor to teach the kids, or teach them himself. This must be teaching of general skills only. It is up to the kids to take these general carpentry skills and use them as they see fit in their Challenge solution. Of course, Team Managers do need to monitor their team’s activities, and make sure that they don’t try to do something that would be unsafe. It’s perfectly OK for an adult to keep their hand on the switch on the power strip whenever the kids are using power tools, and to remind them to always wear safety goggles. That’s not Interference! It’s important for all Team Managers to study the Interference section in the Rules of the Road. You will want to understand what you’re allowed to do for your team, and what you’re not allowed to do for them. But what about the well-meaning parents and friends who might want to help your kids by offering advice on how to solve their Challenge, or even try to provide hands-on assistance? The best way to prevent Interference is to talk to your team and their parents about Interference. Your kids can learn to recognize Interference, so they can politely refuse any outside help, and if their parents understand why Destination Imagination has this rule, they will be much less likely to try to interfere. Planned activities for a night with your team and their parents that’s focused on Interference and how to avoid it. To run this, you’ll also want to download copies of the Interference Game and the Interference Oath (see below). Question-and-answer game in which the participants learn about Interference. Fun non-Interference pledges that you can administer to parents and Team Managers. For the best effect, ask those taking the pledge to begin by raising both one hand and one foot. If you are unable to meet with all of your parents at the same time, that’s OK! The important thing is to have this conversation with your kids and their parents. Interference typically occurs when an adult who doesn’t know about DI’s rules prohibiting Interference decides that team could use a little nudge in the right direction. Educating both your kids and their families about Interference is the best way to prevent this from happening!